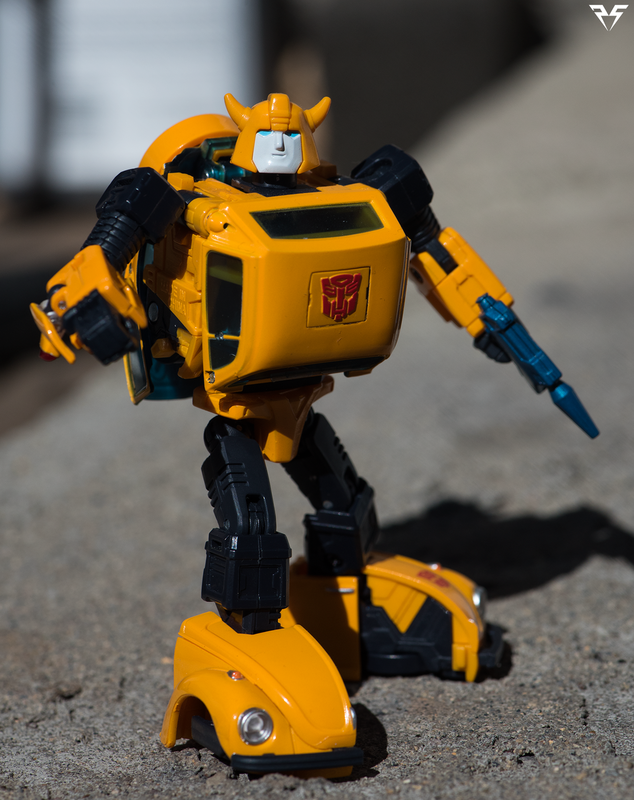 Today I'll be taking a look at Takara MP21 Masterpiece Bumble, AKA G1 Bumblebee. A quintessential member of the G1 Autobot crew! Bumblebee has become a fan favorite with kids and adults alike due to his leading roles in recent Transformers TV shows and movies. This Masterpiece figure is based on the original G1 design of everyone's favorite little bug! 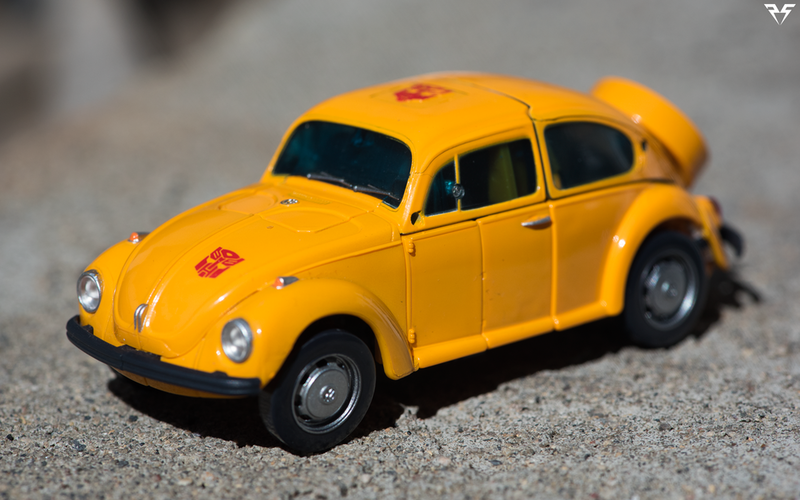 Bumblebee's vehicle mode is a licensed Volkswagen Type 1 Beetle. Due to licensing the vehicle mode does looks slightly different than it's on screen counterpart from the original cartoon. Bumblebee has official VW emblems on the hood and hubcaps of the car. He also has a single rear view mirror on the driver side, that comes attached to a sprue in the box. The mirror can be pegged in to the small hole in front of the drivers side window. (Which keen eyes will notice, I forgot to do :/) He also has a black licence plate on the rear that can be pulled off to make way for the spare tire carrier. The spare tire can be a point of contention for some, Technically most Volkswagen Beetles carried the spare tire in the trunk and there was no external spare tire carrier. Bumblebee's G1 TV model, shows a spare tire carrier on his back in Robot mode, and as such this piece has been added to allow for closer accuracy to the cartoon model. The black license plate accessory can be stored in the spare tire carrier for safety. Bumblebees yellow paint is well executed and he doesn't have nearly the issues with matching colors that other figures like MP Sideswipe or MP Prowl suffer from. My only concern with his alt mode is that due to transformation his front wheels have a tendency to slant inward and don't lock into place. His pistol can be stored on the underside of the vehicle, as well as the spare tire if you don't like the inaccuracy of it being attached in vehicle mode. Bumblebee transforms into a squat, agile little scout. His front hood unfolds into legs and massive boot-like feet that give him great balance. There are even ankle tilts side to side and front to back! He has a good 90 degree bend at the knee that can be exaggerated by un-transforming part of his feet. He's got a full 360 waist swivel and ball jointed hips for a great range of movement in the legs. The square portion of his hood tucks away in to his mid-section during transformation in one of the coolest feats of engineering I've seen from the MP line in a while. His roof and rear of the vehicle compact in to a backpack that tucks in quite nicely. Now, there is one point of contention that will probably cause some MP fans to cry foul... His arms. Bumblebee's arms are perfectly functional and look great, however, there are large gaps in his forearms from where his fists flip out for transformation. There are also small pieces of kibble that form the rear of the fenders and tail lights in vehicle mode. It would have been nice to see a flap or cover engineered to cover the hole, but in all honesty it's not that visible unless you are searching for it. Due to his small stature his hands are also slightly less complex than your typical MP release. He has molded fists with no finger articulation or wrist swivels. The fists are molded with rectangular hole that fits his pistol snugly. His head has removable face plates (MORE OF THIS PLEASE!) to change his expression. He comes with a neutral face and a smiling face packed in the box. If you ordered him from Amazon Japan he also comes with a battle mask variant referencing his original G1 toy. His head is on the familiar 2 axis hinges, with a 360 degree neck swivel and an up and down nod. Be careful during transformation as some people have scratched the paint on Bee's face while converting him to vehicle mode due to how the head fits into the rear cabin. His final feature in bot mode is a spinning panel on his chest, that can be rotated to reveal a molded raised Autobot insignia. This can be rotated to a plain yellow panel if preferred for alt mode or bot mode. Bumblebee also comes shipped with a small human character in an exosuit, similar to the designs shown in The Transformers Movie. In my haste I neglected to photography this accessory and I will add a couple photos of him shortly. As a package, Bumblebee is a strong masterpiece release. Due to his small size and his limited accessory count some people may be turned off by the relatively high price tag. Similar to Soundwave's cassettes it is a hefty price tag for a fairly minimal release. No one can deny the importance of Bumblebee in a proper G1 line up, but if you're not a completionist or a Bee fan, it might be worth trying to get some hands on time with this little bug, or look for a good deal before pulling the trigger on a purchase. I absolutely feel that Bumblebee continues the tradition of well engineered and great looking masterpiece Autobots, but there are some sacrifices made to fit budget and overall size that can be overly apparent to those who are sensitive to the issue. 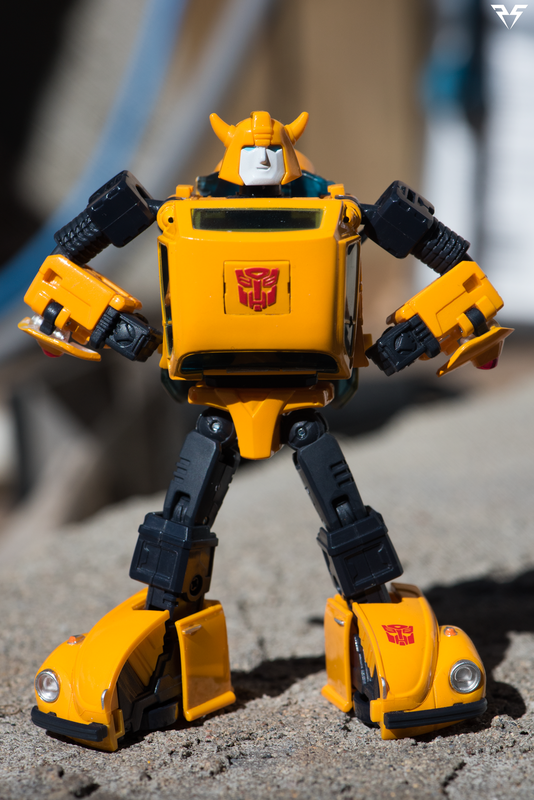 Check out the gallery below to see more of MP-21 Bumble aka Masterpiece Bumblebee!